Click to view full size. Brochure is 10-panels and folds down to 5 x 5″. That’s what marketing director Susan Licate told me when approaching me to design their Intern Brochure. Susan further explained that the goal is to be seen as a major player to the top talent of our areas’ colleges. 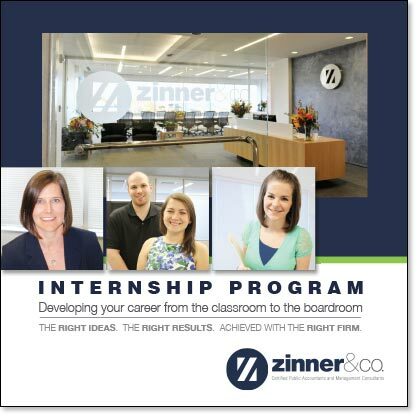 The brochure needs to convey that Zinner is a fun and progressive company to work for with a lot of opportunity. Susan and I have worked on many important projects over the years – from annual reports in the medical industry to college alumni fund raising magazines, and she typically let’s me just do my own thing as far as design goes. But, with this piece, she had something particular in mind. Susan brought in Edwards Communications to help overhaul Zinner&Co.’s branding. And in this case, she wanted to push the boundaries of their conservative corporate identity to appeal to our young audience. So we discussed the color pallette… then Susan added to that pallette… and then added again. She also provided the engaging photography that I requested – custom shots of real employees (former interns). I contributed the idea of this original, custom size that let’s their story unfold in an engaging way. I also suggested the QR code on the back, which Analytics tells us was a very successful addition. To see another corporate brochure design <<< go here.